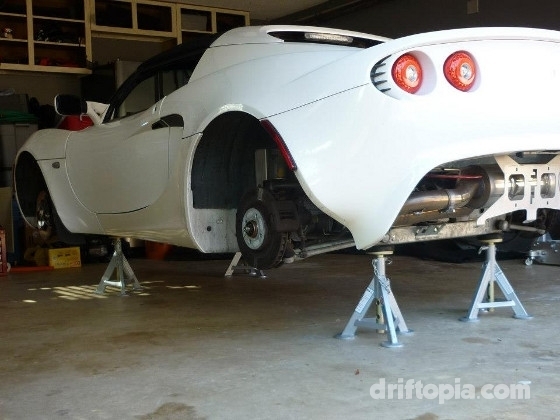 The Larini decat and club sport exhaust serves two purposes on project Lotus Elise. For starters, this combo along with the rear panel delete can easily yield weight reduction values approaching 25 lbs. 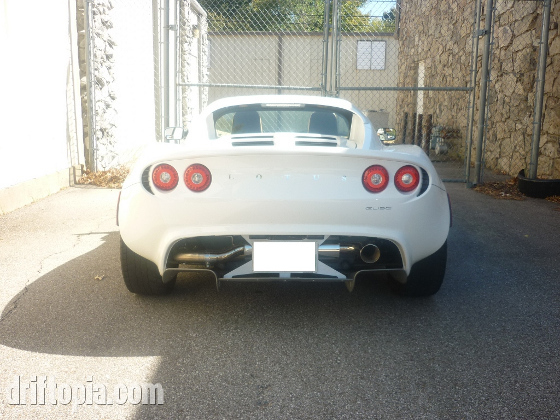 The other purpose is to wake up the exhaust on the Elise because frankly, a car like this needs to be heard. Now what you won’t hear me talking about is power gains because the Lotus Elise’s ECU is a fickle beast at best and most bolt ons will yield negligable improvements unless properly tuned for. Note: This guide is 90 percent complete. I suffered a rather traumatic computer crash and lost several months of notes and photos as a result so there may be a few minor errors in some of my measurements (like bolt measurements and sizes). However, this guide will still work for 99% of the DIYers out there. I will also update this guide as I complete other modifications and can rephotograph or measure the pertinent areas. 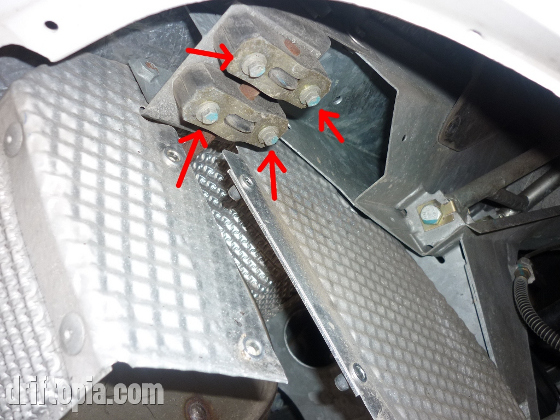 For this guide you will need to remove the rear splitter (the rear undertray can stay on) and the rear license panel. The rear license panel will either have to be modified by removing the right perforated panel (add hyperlink) or replacing it with a rear panel delete which yields even greater weight savings. This image shows the rear panel eliminator from Sector111. It is a light weight license plate holder that saves about 4.5 lbs in place of the stock panel. It also allows more airflow through the rear end. Also note the rear heat shield is still installed at this time. 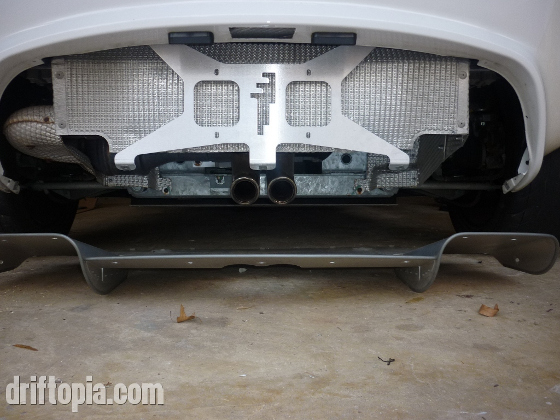 After the rear splitter is removed, locate the two access panels on the sides of the exhaust heat shield and remove the 4x8mm bolts (per side). 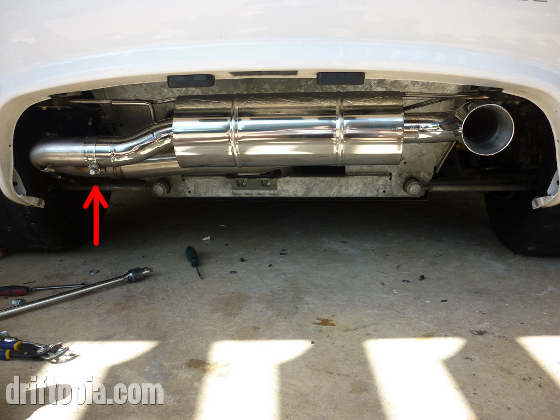 Once these panels are removed, locate the slip joint between the cat pipe and the exhaust and loosen the 12mm nut. (Note: PB Blaster or WD40 can be used on this joint if it is rusted tight.) 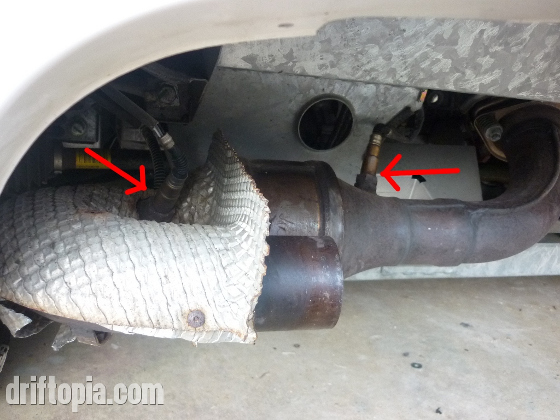 Finally, locate the two sets of hangers at either side of the upper (clam side) ends of the muffler. Remove the 4x8mm bolts per side and the exhaust (muffler) will slide out to the right. 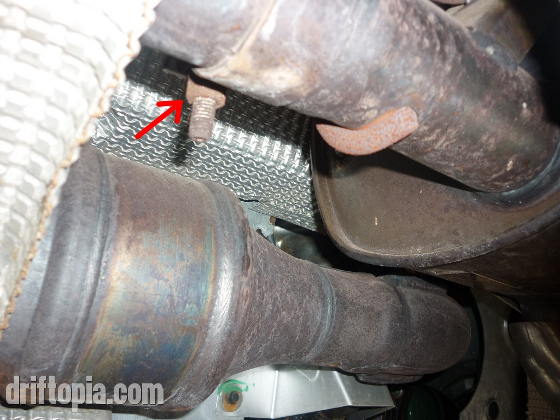 Again, if the slip joint is seized a few taps with a mallet on the left side of the muffler should break things free. 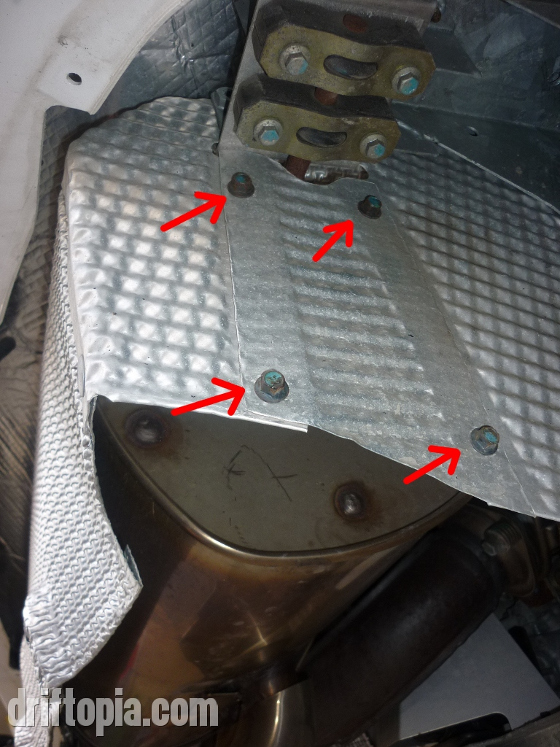 There are two access panels (one per side) that must be removed from the stock muffler’s heat shield. Loosen the 12mm nut on the slip joint. There are 4 exhaust hangers, 2 per side, that hold the exhaust to the frame. 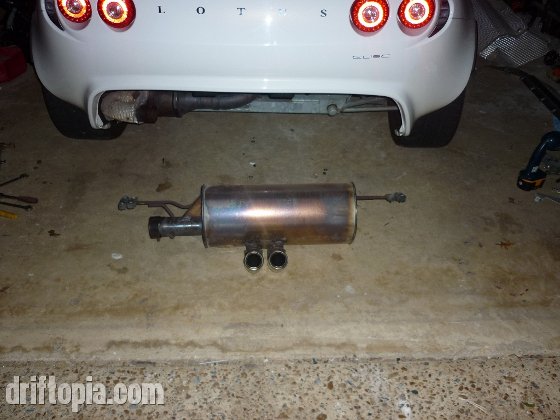 The factory exhaust removed from the Lotus Elise. 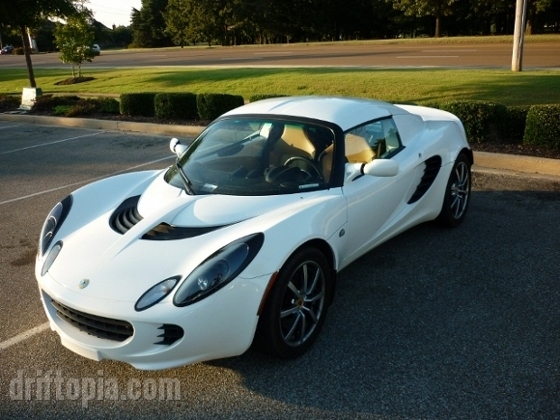 The stock exhaust from the Lotus Elise weighs (26.2 lbs) where the Club Sport (6in) weighs in at only (12.5 lbs). Note: The heat shield around the factory exhaust will need to either be trimmed or removed at this point to accomidate the side exit exhaust. I opted to remove the heat shield on the Lotus Elise as the addition of the rear panel delete mentioned earlier increases airflow through the rear, reducing the need for heat shielding around the rear clam. 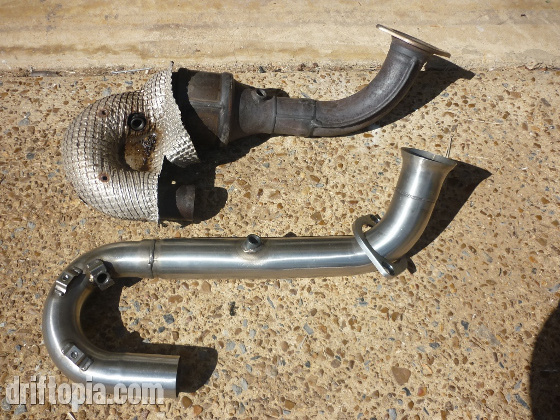 With the muffler side of the exhaust out of the way, remove the two oxygen sensors from either side of the catalyst. I typically use an adjustable wrench to remove the sensors. Once the oxygen sensors are out of the way, remove the 2x14mm bolts that hold the catalyst pipe to the header. Remove the 2 oxygen sensors from the catalyst before disconnecting it from the headers. 2x14mm bolts hold the catalyst pipe to the headers. The stock catalyst from the Lotus Elise (10+ lbs) with the Larini Decat (5 lbs). The Larini Decat replaces the factory catalyst and bolts to the header. Once again installation is the reverse of removal. Place the exhaust hanger bushings and washer from the stock exhaust onto the new one. 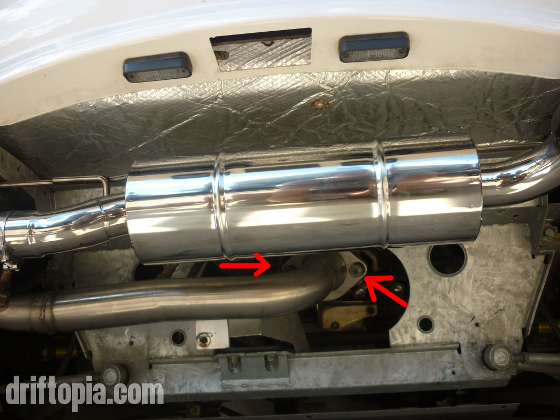 Then, with the exhaust clamp on the engine side of the new muffler, slide the new muffler onto the decat pipe. 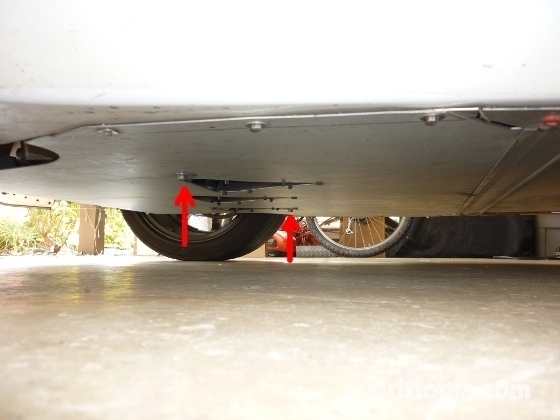 Rotate the muffler upwards until the exhaust hangers make contact with the rear subframe. Align the hanger bushings and tighten the new exhaust using the 8mm bolts (4 per side). I’d recommend hand tightening and then 1/2 turn with a wrench. Then tighten the exhaust clamp to somewhere around 30-40 ft-lbs. 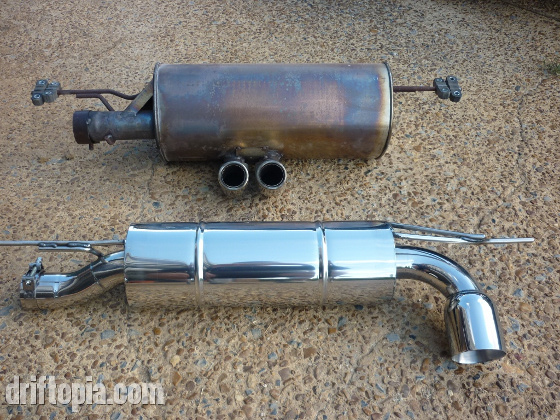 After sliding the muffler onto the decat, rotate the muffler upwards and reconnect the new muffler to the rear subframe. 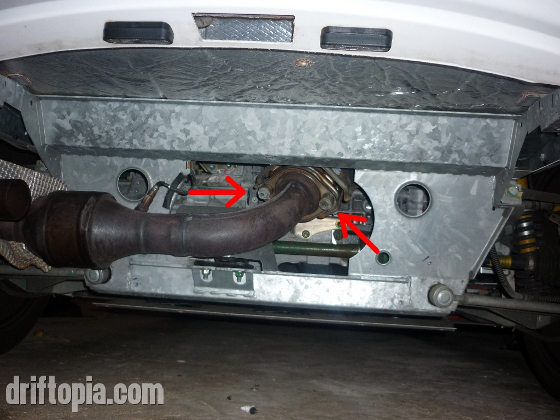 Tighten the exhaust clamp after mounting the muffler via the exhaust hangers. Now you just need to reinstall the rear splitter and rear panel or alternative and you are good to go.